Preheat the oven to 180°C. Brush the base and sides of six 200 ml ramekins with melted butter. Add the breadcrumbs and swirl around to coat the inside of the dishes, shake out the excess. Place onto an oven tray. Melt the butter in a medium saucepan and add the flour. Stir over medium heat, cooking for 1 minute. Reduce the heat to low and add the milk a little at a time, stirring until combined and smooth between each addition. Increase the heat to medium and bring to the boil. Stir constantly for 2 minutes while the mixture cooks and thickens. Remove from the heat and stir in the cheese until melted. Cool slightly, then whisk in the egg yolks. Season to taste and transfer to a large bowl. Using electric beaters, beat the egg whites in a large, clean dry bowl until stiff peaks form. Stir a large spoonful of the egg whites into the cheese mixture to loosen. Using a large metal spoon, fold the egg whites through the mixture, taking care not to lose the volume. Spoon into the prepared ramekins. 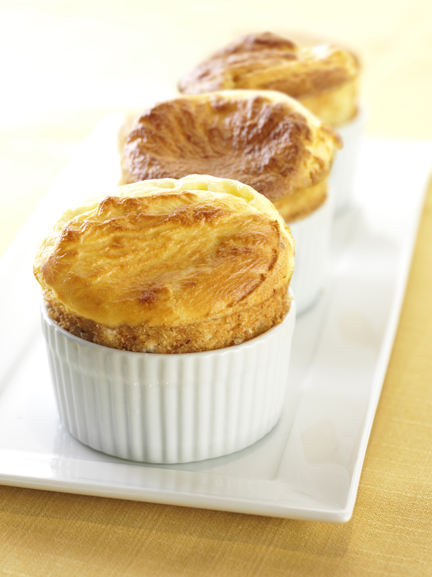 Run your thumb around the inside edge of each ramekin – this helps give the soufflé a nice shape when cooked. Bake for 20 minutes, until risen and golden. Serve immediately.